Two types of pulsating stars exist among stars with a mass between 1.5 and 2.5 solar masses: the delta Scuti stars and the gamma Doradus stars. Theory tells us that when such stars have a surface temperature between 12,000 and 12,900° F (6,600 and 7,100° C), they can have both types of pulsations, i.e., they are called “hybrid stars.” The NASA space mission Kepler provided a wealth of new candidate “hybrid stars,” even outside the theoretically predicted physical parameter range. Coralie Neiner from the Paris Observatory and Patricia Lampens from the Royal Observatory of Belgium have therefore sought which physical phenomena could mimic the hybrid character in delta Scuti stars. One possibility could be the presence of a magnetic field that would produce spots on the rotating stellar surface and mimic the gamma Dor pulsations. However, no magnetic field had ever been observed in a delta Scuti star until now. They proposed to observe HD 188774, a Kepler hybrid candidate star, in order to look for the presence of a magnetic field. Based on spectropolarimetric measurements obtained at the Canada-France-Hawaii Telescope, they showed that the star exhibits a clear magnetic signature. This represents the first detection of a magnetic delta Scuti star. It further shows that the signature of a magnetic field can be confused with that of gamma Dor type pulsations. The discovery that HD 188774 is a magnetic delta Scuti star and not a true hybrid star opens the perspective of a new interpretation for the Kepler observations of other hybrid stars and of pulsating stars in that mass range. 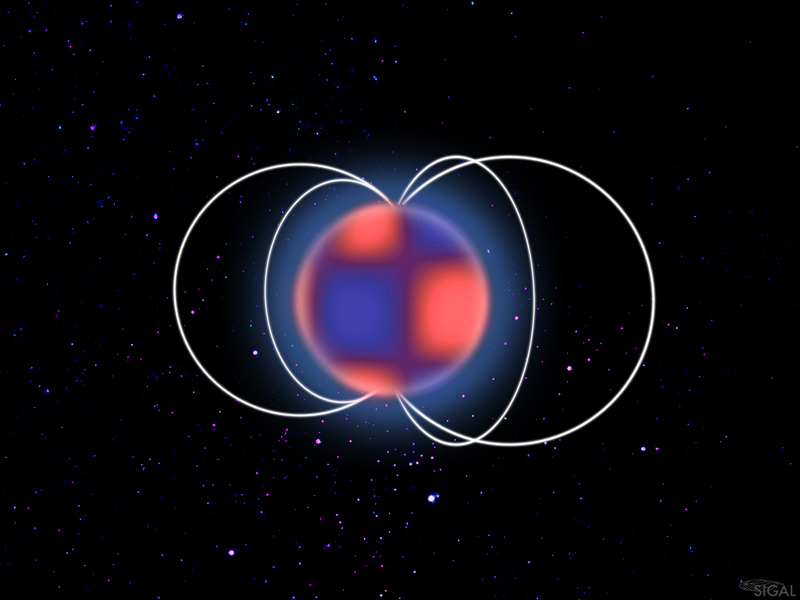 This has important implications for understanding the deep interior structure of such stars.